Or the way the roulette players never seem stressed, at least not like the black jack players. 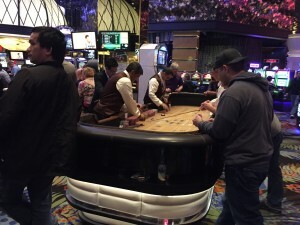 I stopped to watch the craps players gathered around a table near the entrance to the resort/casino I’m staying at in Reno. I keep inadvertently stepping into the pit, which is very disconcerting to the pit boss. Just trying to get a view of the game, which makes me wonder if tall players are more successful, because they can view the whole table at once. The markings on the table might as well be a runic alphabet. My mind cannot process them at all. So I watch the old guy in a white fedora with shaky hands and a gold rings toss a few white chips with red-checkered rings on them onto the felted surface while muttering that he’s down one hundred dollars. Several southeast Asian gentlemen hunch over the table, casually placing chips here and there, which almost convinces me that there is no strategy, that simply tossing a chip anywhere might win you something. But this is their poker face I learn quickly. They have a whole cadre of onlookers to dupe. A long stretch goes by where nothing happens. I’m bored almost to tears. Numbers do that to me. I want a drink, and the people watching at this point is almost painful, because they’re not interacting, so intent are they on what happens when those two little dice are tossed toward the end of the table. I back up but am told I’m now in the pit, please move. I turn around. Still in the pit. I wonder off toward another table and see some people from the conference I’m attending. I stay only long enough to try and listen to a half-hearted explanation by someone who understands the concept of craps only marginally more than I do. I have $40 in my pocket, but I get a beer from the bar and walk through the slot machines half admiring the smokers lucky enough to be puffing one inside a building in the United States. The craps players have money. At least a little. The slots players are pensioners, I’m told. They’re here all the time, bused in from out of town or visiting, as they often do. I watch their eyes get small as they pull the handle, which activates a digital trigger, which sets the machine in motion. It’s so mechanical now. It’s methodical, and part of me believes they actually enjoy the repetition as much as they do any winnings they get. My colleagues at the convention mostly break even, winning a couple hundred, losing a couple hundred and coming out somewhere in between. No calls home to the wife necessary. A few win a few hundred bucks. That’s cool. I’m not a gambler. I can’t bring myself to throw money at chance. Not to say I don’t waste money. I do. I’m not good with money. It terrifies me. But this waste seems bigger to me. I’m told that’s because I’ve never won big. If I won big, I’d be a gambler like everyone else. I wondered if that was true as I fell asleep last night on the 21st floor of a casino tower overlooking Reno. I still admire gamblers. I still like walking through a casino. I was raised to believe they are sinful. Which is probably why I like them. Forbidden places are so hard to resist. Bright lights, fairy tales, free drinks. But I’m older now, and the lights aren’t as bright. I actually thought about bringing my kids to this place so they could play in the arcades and pools while my wife and I sip cocktails and play roulette. I quickly remembered the Arches and Grand Canyon and Yosemite and all the other places that fill my soul and shook the idea loose from the inside of my skull. What the hell am I thinking. Why is this attractive, these lights, are we flies? Attracted to that blue light and the death that comes along with so freely like the cocktails by the pretty girl you just gave your last twenty dollars to. Should probably quit while I’m ahead. But words are like dollars. Just a few more and there will be magic, right? Just one more pull of the lever, another paragraph, and cha ching. Someone once told me it’s all hard work. Every last luxury out there that isn’t earned doesn’t really exist. Not really. And I see it all floating out there in the harbor of their view, beyond the craps tables and the roulette wheels and the slot machines. The yachts, the motorcycles, the double wide with the redwood deck. Get out of the pit, I’m told, one last time, so I head up to my room to finish my beer in the dark and quiet, a place I’ve come to like more than I thought I ever would.